New to the forum. My 6 year old son is an AVID Thomas the Train fan and has many trackmaster trains and sets. He also loves to take things apart . One morning before waking us up, he found a screwdriver and took apart the the grayish/tan track piece of the Daring Derail set that has the explosion effect that pops up as he goes by. I have tried to put it back together and I can figure out where almost all the pieces go on the inside, but it is not intuitive. 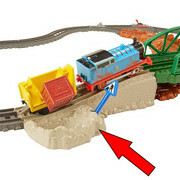 Would anyone be willing to unscrew the bottom of their own track pice and post a pic of it here?? My son really wants this back together and I can't find a schematic of this online anywhere. Appreciate the help! Can you post some pics of the specific parts in question? Thanks. Wish I could help Dr Prime but I don't have one of those sets. Yes! That is the part! I currently have it partially put together and I've screwed the bottom back on to keep it in place. I have 2 parts that I cannot figure out exactly where they go. I will try to take a pic later this evening when I get home of what I have put together so far. Thanks for the warm welcome! I think you have a budding engineer in your six year old. Reminds me of...me when I was young, taking things apart to see how they work but too young to know how to put it back together. I do wish somebody has one and can help you as I am curious now too. Worse case...you could buy a used set on Ebay, cheaply....open the piece to see how to reinstall the parts and then relist the same set back on Ebay. Haha! Yeah, he is fascinated with how things work. He's taken apart so many engines to see the motor. I can't tell you how many trains we've had to fix and he always wants to see the insides. It is annoying and adorable at the same time, lol. I did think about doing something like that. I was hoping to avoid the hassle though of buying and reselling. I'll give it a little time before going that route. By the looks of the parts in your photo I would think that once you see an example it would be easy to re-assemble as long as there isn't a spring that went somewhere. Man, I loved taking things apart when I was a kid! I could usually put them back together but I’m sure that wasn’t always the case. I wish I could offer help with this particular problem but I can’t remember if my son has this set or where it would be if he does. Anyone out there ha e this set??? have you tried emailing fisher-price? a friends nephew also has a habit of taking his engines apart. as a result i no longer buy them for him for birthday or christmas, as he would always misplace one of the parts, and then expect either myself or his uncle to magic up a replacement on demand. I was really hoping someone could help with an inside picture because I am interested in how it will go back together. I wish I lived close as I would like to take a shot at figuring it out. (04-11-2019, 08:08 AM)sunhuntin Wrote: have you tried emailing fisher-price? I could I guess. I'll give that a try, but my experience with toy companies myself is that they are usually not very helpful. If they do help out though, I'll be sure to post and let everyone know! I did email Fisher-Price. When I checked their website, they actually had a link where you could buy parts too! So I was a little encouraged that they might be helpful. It took about 2 days for them to get back to me and they sent me a link to the instructions for the Daring Derail set. I thanked them, as I thought it was nice of them to try, but I said "unfortunately, not only do I already have the set instructions, but they are not helpful as it does not tell me how that particular part is assembled on the inside" (which I stated in original email was the problem).